When red tide ravaged Corpus Christi last September, marina staff was tasked with ridding the water of all the fish that died because of the toxin. The staff teamed up with other agencies working long hours for two weeks to retrieve 35 tons of dead fish. "It was a very tedious effort," said Peter Davidson, marina superintendent. Davidson and Tom Tagliabue are confident they've found the solution to keeping the water clean while minimizing the manpower: a multipurpose boat from MERV-Marine USA. The company demonstrated the Marine Emergency Response Vessel at the sea wall Friday afternoon. Corpus Christi is seeking $700,000 from RESTORE Act funds to become the first city to use the vehicle. 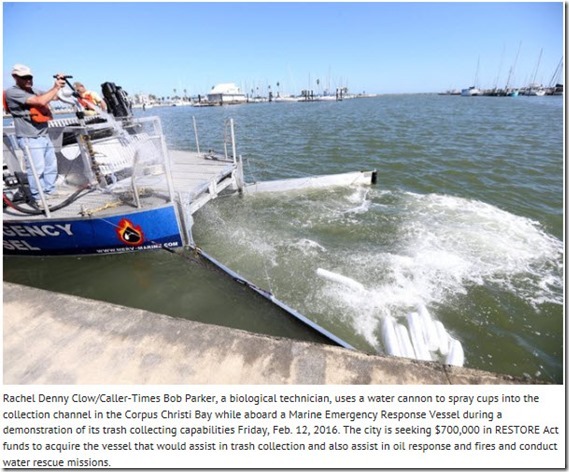 As city council member Colleen McIntyre tossed bags of Styrofoam cups into the bay, the vehicle slowly chugged along the sea wall picking up the trash with a rotating wheel. The trash would stay in a container within the boat while the water flowed back into the bay. The MERV also skims oil from the water, and has a water cannon that can be used to fight fires or direct debris into the trash collection channel. Overall, the vessel has 27 different functions. "The marina has a lot of different responsibilities," said Tagliabue, director of intergovernmental relations. "You'd need multiple vessels to help us accomplish all of those tasks so finding this vessel ... was a godsend." Wayne Fellers, CEO of MERV-Marine USA, said the watercraft was the result of an idea that came 10 years ago. As a graduate of Texas A&M University-Corpus Christi, he said it was important to display the boat for the first time ever in the city. "When you see the pride and the people of this city, it's a pleasure to be a part of that," Fellers said. The city has until March to apply for the funds, Tagliabue said. "We think this project is one that achieves the priorities we've established for the last couple of years," he said.